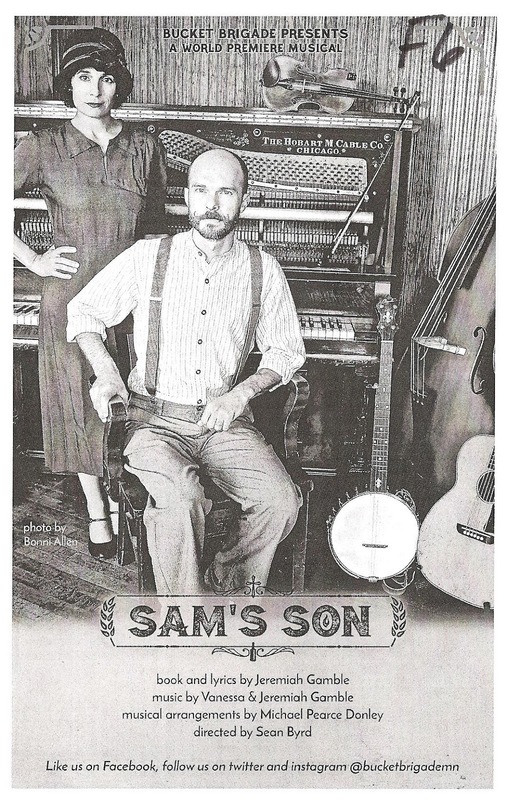 A new original musical is just about my favorite thing in the world, so the new musical Sam's Son by Bucket Brigade, a company that specializes in new work whose work I've enjoyed in the past, was on my must-see list in this busy #TCTheater October. Performed in the intimate, immersive space that is Art House North, I was not disappointed and found it to be a highly entertaining evening (complete with free intermission treats - root beer and a pretzel). 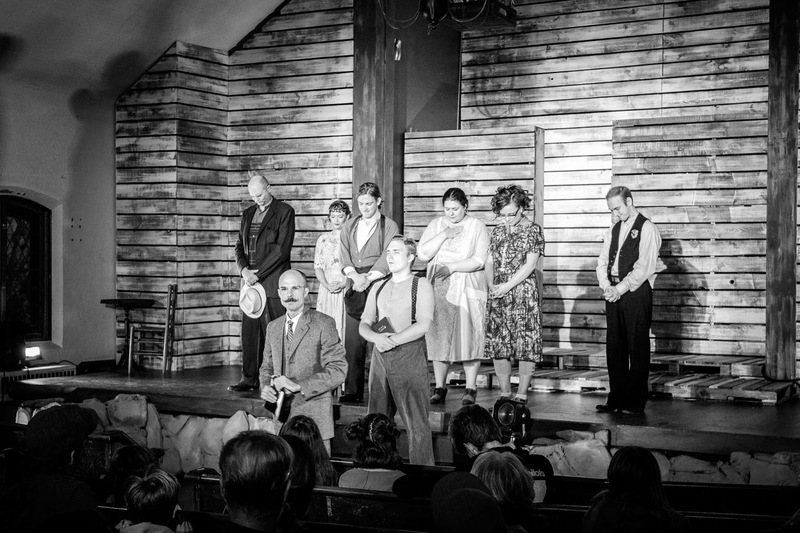 While the plot points may be a bit cliche and predictable, the story is well told by the talented cast, with a fantastic original score tinged with gospel, bluegrass, and old-timey feel while still sounding like a modern musical. 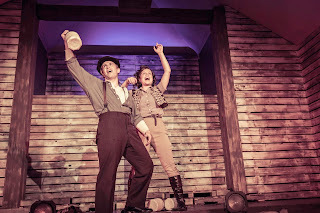 It's such a treat to see new work that is locally created (written by Bucket Brigade co-founders Vanessa and Jeremiah Gamble, and developed in part through Nautilus' "Rough Cuts" program) and showcases local talent in an intimate setting. 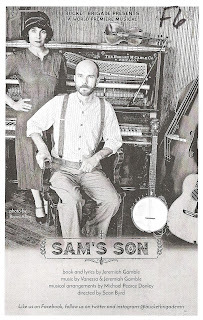 Based loosely on the Biblical story of Samson, a Hercules-like strongman who loses his power when he cuts his hair, Sam's Son tells the story of the son of a preacher man in a small rural town called Goode during the Prohibition era. He's the hero of the town, his latest feat being the rescue of a drowning man, accomplished by pulling a tree out of the ground and offering it to the man. But his righteous father isn't proud, he's angry that Sam Jr. was hanging out by the river, because that's where the hooch is made. Yes, this perfect town of "good" people has a dirty little secret - the production and distribution of illegal spirits. This brings Prohibition agent and Sam Sr.'s ex Miriam to town along with her teenage daughter Della (read: Delilah), born shortly after Miriam left town. Della meets Junior by the river and introduces him to the finer things in life, including the whiskey they find hidden there (which Sam's father told him would end his strength). Anyone who's watched a soap opera can see that this relationship maybe isn't a good idea, as Miriam confirms when she finds out. After Sam's journey down the whiskey river ends in tragedy, father and son have a long overdue heart to heart, as do mother and daughter, and they all vow to clean up the town and end the hypocrisy, giving Sam one last chance to be the hero. 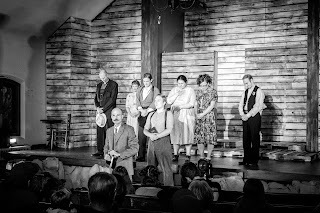 I was truly impressed with this cast, fully immersed in the storytelling in this intimate setting with nowhere to hide (under the direction of Sean Byrd). 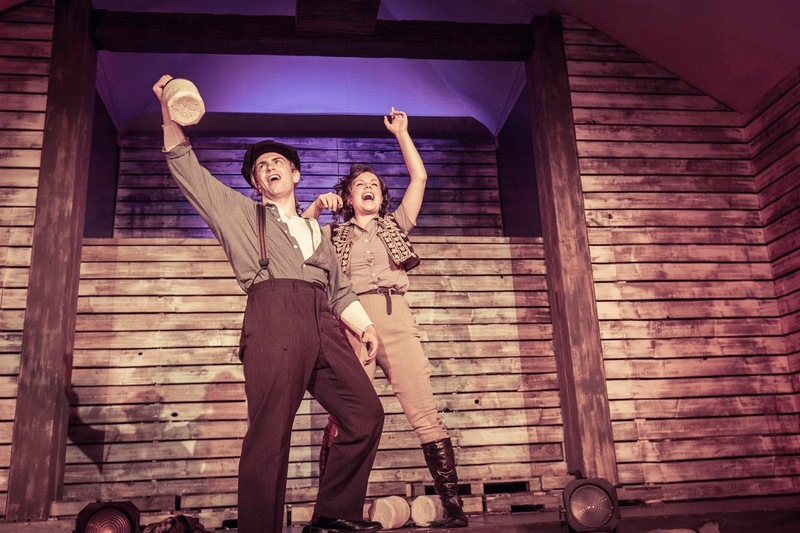 The creators of the piece star in the show; Jeremiah beautifully conveys the emotion hidden behind the repressed and strict preacher exterior, and Vanessa is strong as the assured Miriam, and also gets to sing a sultry speakeasy song. Trevor Bunce is a star in the making as Sam Jr., with a beautifully open and expressive face, fantastic voice, and boundless energy and stage presence (his bio describes him as "a Minnesota native now living in New York," but here's hoping he moves home). He's well-matched in Kayla Peters' Della, also an exciting newcomer to the #TCTheater scene, and their duets are gorgeous. The talented ensemble, most of whom play multiple characters, also includes Bonni Allen, Gail Ottmar, Pete Colburn, Riley Parham, and Seth Tycon. Art House North is an old church in the West Seventh neighborhood of St. Paul that has been converted into a space for art, theater, and music, and has been Bucket Brigade's home the last few years. The best thing about the space is that the actors are not miked, and the sound is absolutely gorgeous in the former sanctuary space. 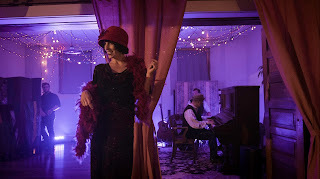 A three-piece band (music director and arranger Michael Pearce Donley on piano, Chris Erickson on upright bass, and Brian Lenz on four or five different stringed instruments including banjo and mandolin) is located in an ante room just to the left, and combine with the gorgeous voices of the cast for a fantastic sound. But perhaps my favorite musical moment is an a capella song with the four leads singing in four-part harmony, so gorgeous I had to close my eyes for a moment to better drink in the sound. I'm quite enamored of the score, it's my kind of music (it's a good sign when they play Alison Krauss, Chris Thile, and the like before the show), and it's really well written with repeated themes. I'm still humming the songs, and if there were a recording available I'd download it and listen to it obsessively for the next few weeks. 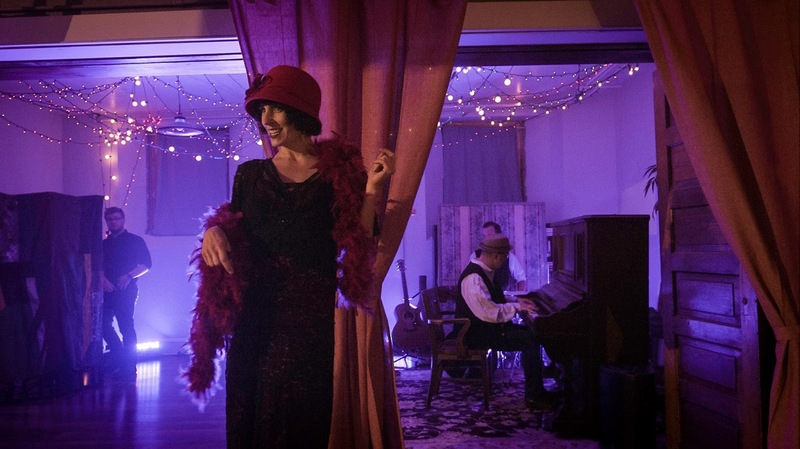 who knew a Minnesota church basement could become a speakeasy? You may never have heard of Bucket Brigade or Art House North, but that's even more reason to go check out their work. 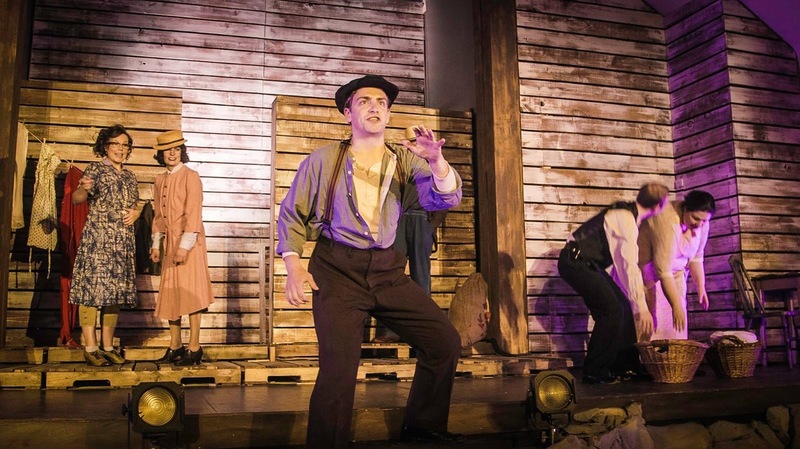 Sam's Son is an exciting new original musical with much care and though put into every aspect, and well performed by the talented cast. Playing Thursdays through Saturdays through October 28 (with a pay-what-you-can performance on Monday October 16).